Version 2.0 of the awards winning utility "7 Quick Fix" is available now. 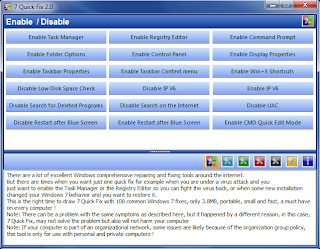 It is the ultimate Swiss army knife for Windows 7 users and professionals. 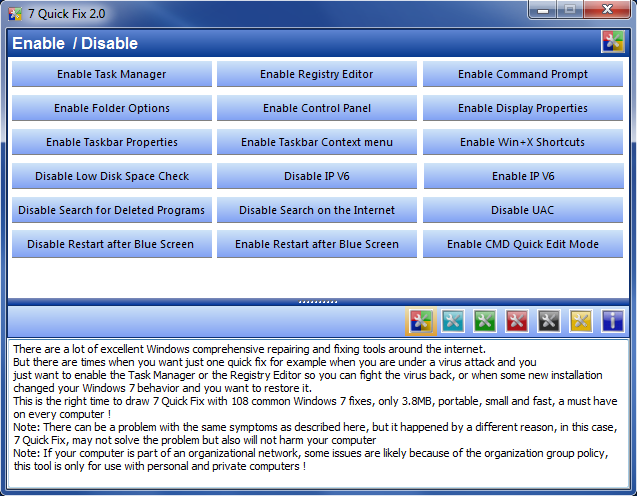 "7 Quick Fix 2.0" a click and fix utility that can fix 108 common Windows 7 errors, problems and tweaks. This is the right time to draw 7 Quick Fix with 108 common Windows 7 fixes, only 1.1MB, portable, small and fast, a must have on every computer or USB drive ! - No scanning or other resource consuming process, just execute and click. A must have on every Windows 7 based computer, when the time comes, you will not regret this 1.1MB on your drive! http://www.softoxi.com/7-quick-fix.html (Look at the AV report). The installation package contains the executable and readme.txt, and that's all, it let yo also set shortcuts and icons but this is optional. After you install it, you can take the executable (QF.exe) and use it on any computer or run it from a disk on key without installing and it will work the same. So yes it is portable ! I've downloaded it, because it's useful to have it on our computers and it can fix many things, if we have some problems. I have a friend who works at IT support Toronto, he gives me great advice and I know that he has the same opinion about this software. Thank you so much for this article! May we have a non install app? But after you installed it once, you can copy the executable (QF.exe) and use it on any other computer or run it from a USB drive, it is a portable app. The XP version of Quick Fix (XP Quick Fix Plus) was transleted with the help of users to 4-5 languages, they sent me the buttons text and the descriptions of every fix and I compiled it for them. Hello there, thanks for the great tool. I like it and now I'm using it. I think you should publish it on your commercial website to get more users. Quarantined by Emisisoft Anti-malware. : "Adware Win32 Somoto.AMN!E1" as I tried to install it! The program is using installer that is offering some third party software (by betterinstaller) it is the users choice to install the third party or not. Some AV software identify this as a threat, this is a false alert, you can find "7 Quick fix 2.0" listed on all major download sites and they verify it is clean and also publishing the clean reports. I sent your false alert to betterinstaller, and they will fix it with the AV vendor. Yes please forward another false positive alarm. Since today TrendMicro identifies it as Adware "ADW_KRADARE". Thank you for this notice, does the alert is created from installer or from the application executable file ? i am keerthy admin of www.xviruslab.com and i would like to share this awesome software with all my viewers with your permission your permission is pending. It is a freeware, so you can share it. A link to my blog will be nice. 7 Quick Fix 2.0 is a nice problem. was easily installed on my PC and working like a charm. Great information, thanks for sharing with us. It is amazing because is portable! !